Tiger Eyes, based on the young adult novel of the same name, by Judy Blume, tells the story of Davey, a 17 year old girl abruptly relocated by her grieving mother to the strange atom bomb town of Los Alamos, New Mexico. With the sudden and violent death of her father, everything that once mattered suddenly seems insignificant. But while exploring the surrounding canyons Davey meets Wolf, a mysterious young Native-American who is able to see past her pain. The connection they make brings Davey back from the edge and sets her on a journey from heartbreak and confusion to love and life after tragedy. 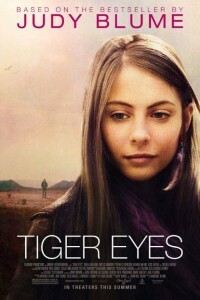 Tiger Eyes is the least popular of Judy Blume youung adult and kids books yet is the first of her books to make it to the big screen. Her son, Lawrence, directed the movie Tiger Eyes. The movie Tiger Eyes features a cast of complete unknowns, (F-listers), is from the teeny-tiny movie studio Freestyle Releasing, which has never had a hit, and has a Video On Demand release the same day as its theatrical release. Thus? Tiger Eyes will be a big fat stinkeroo at the movie box office. Nationally acclaimed evangelist John Luther is the last obstacle in the way of sweeping religious reform in the States. When a U.